Since the launch of my website I have had a number of comments regarding the picture of me in tunics and BA gear. The reason for the attire is this: you have to be careful what you say to firemen – especially when you are bored of waiting for your case to be called on at Court. 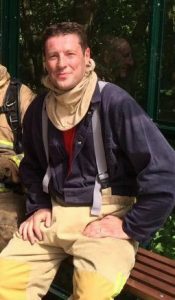 It was during a lengthy wait for a Court hearing that I happened to mention to my colleagues at Lancashire Fire and Rescue Service that I would really interested to find out what it would be like to go into a burning building with breathing apparatus and fire protective clothing. I immediately recognised my error when the faces around me broke into broad smiles and I was told immediately, “that can be arranged”. I was then very quickly invited to a full breathing apparatus, training day at LFRS Headquarters, followed by a day learning about and witnessing fire behaviour. As the training date approached I was frequently asked by my legal colleagues why I would put myself in such a position. The answer is that for over 10 years I have been explaining to Courts why compliance with fire regulations is so important. My job is to outline how breaches of the regulations can lead to risks of serious injury or to life. I believed that personal experience of going into a burning building with the appropriate fire fighting equipment would assist me in the future when persuading Courts how serious the consequences of failing to comply with fire regulations could be. The first part of the day was spent familiarising ourselves with the equipment. My fear was that I would feel claustrophobic with face mask and oxygen tank on my back, but I quickly got used to the set up. Once we were properly kitted out we went into the fire house to observe a fire crew entering a pitch black, smoke filled, building using search and rescue techniques whilst unravelling a hose. Of course, what struck me first, was the heat. I immediately felt very stupid because for years and years I have been explaining to Magistrates about the potential impact of smoke and fire upon the residents of buildings, without mentioning the heat. It could be said that by explaining the consequences of fire it would be clearly obvious that a bi-product of fire was heat, but I immediately formed the view that I had not done this particular aspect justice. I immediately made a mental note to add to my future case openings, the impact of fire, smoke and heat to anybody who would not be wearing breathing equipment and fire resistant clothing. The second major impact was the smoke filled darkness. We had the benefit of a thermal imaging camera, but the fire crews were completing technical and complicated tasks whilst going upstairs and searching a building with no light whatsoever. The professionalism and technical expertise of the fire crew was something to behold, but although I had mentioned to Courts in the past about the potential for the electrics failing in the event of fire, and the importance of emergency lighting, the personal experience of a smoke filled, pitch black, heated environment really brought home the potential effects upon residents of buildings, who maybe awoken in the middle of the night with the smell of smoke or with a fire alarm sounding. We had been adequately warned and prepared, but the effects of smoke, fire and heat upon a surprised sleeping person must lead to some very unpredictable behaviours, thus increasing the risk of serious injury or death. Fortunately I was able to watch the whole exercise without trying to escape. But there was more to come. Once we had cooled off we were told that our exercise for the afternoon was to go into the same building and locate a leaking gas cylinder and isolate it. We would have to enter the building on the second floor and carry out a full search of the building, locate and isolate the leaking gas cylinder. It was a nervous lunch. With all equipment rechecked we went into the fire house together and carried out our search. Fortunately our mornings’ experience had prepared us for the heat and the darkness. But the responsibility of carrying out the search ourselves brought home a number of other factors which heightened my appreciation of the risks involved. The first factor was the importance of the protected escape route. I realised immediately that any lay person trying to escape through a dark, smoke filled exit route would be lucky to make it out safely. The second factor, was the importance of not having hazards or obstacles upon the escape route or anywhere, for that matter, within the building. Using our arms to check above our heads and clinging to the left hand wall we managed to navigate the upper floor and then the rake ladders that were used to progress to the ground floor and locate the rather scary gas cylinder. I had satisfied myself that the gas cylinder was unlikely to cause any kind of explosion for the purposes of this training exercise. But the reality of the risks for fire fighters entering buildings without that certainty was really brought home. We managed to locate the cylinder and turn off the leaking gas supply. We were prematurely pleased with our efforts. As we hastily retraced our steps back up to the 2nd Floor we were told by our Training Inspector that we should look around to make sure that we weren’t leaving anything behind. It was then that we identified a body on the floor. This hadn’t been part of the task. We quickly agreed between ourselves that the body was dead – and that there was no point in hindering our own escape route by trying to recovery it from the building! I am not sure that that was the correct procedure. Nevertheless we managed to successfully find our way back out of the building where we quickly took off our mask, helmets and tunics. What struck me then was just how comfortable the breathing apparatus and fire proof outfit had made me feel. It made me concerned that such equipment could lead to a false sense of security for fire fighters failing to appreciate the devastating effects of heat, fire and smoke when so properly and adequately protected. And so it was that my passing comment made in Court had led me to a thoroughly rewarding and useful exercise. To witness fire, smoke, heat and gasses in the darkness was a salutary experience. It will certainly change the way in which I address the Court in the future. It was just as I was reflecting upon the whole experience that we were then invited to come back the following week to witness ‘fire behaviour’.